Web design entails the two most major processes: the creation of the nonfunctional appearance/design and the functional (coded) site. AKA designing and programming. When I was freelancing at DDB Tribal, I created the visual template of a microsite and email campaign for DDB's client Dyson. My 4th Generation Camaro History site for my automotive hobby is exactly what it needed to be: a quick and easy information resource with photos and text. Nothing very fancy, but it fit my vision. 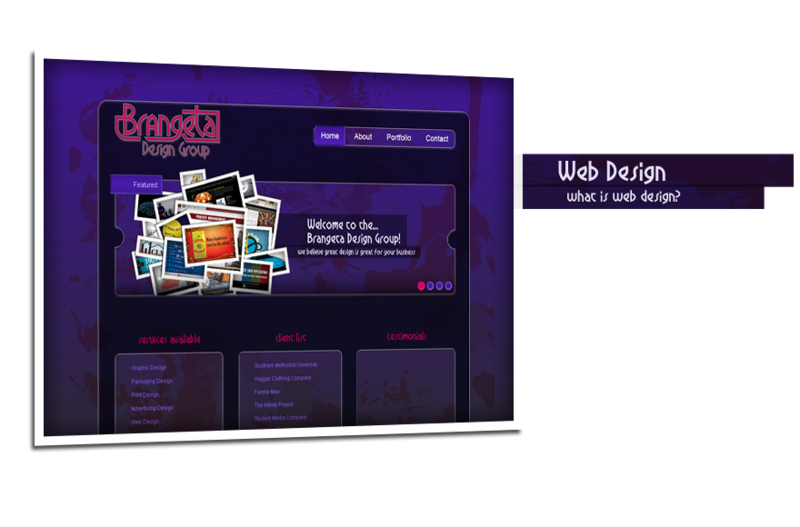 Before doing business as Brangeta Design Group, I had a self-promotion site in 2008. I still think the design is beautiful. Brian Langis started a wonderful redesign concept for dragonballtoys.com and I refined it. Unfortunately this design was never put to use due to internal problems within the ownership of DBT. This simple looking site was designed for a very small clothing line to show off their collections. Miller Professional Counseling wanted to finally have a web presence. The owner, Matt Miller, wanted a clean design that would bring awareness to his company logo I designed and wanted the site to be simple for anyone to use, yet innovative and clever. The logo on the home page was designed to be exactly that. We've since then made additions to the site, but the simplicity of the original is what I am showing on the left. Dragon Ball Figures is a responsive forum that I started for the DragonBall Z figure collecting community. The website is hosted on ProBoards with their software and programming along with my heavily modified CSS3 and other additions. If you "Request Desktop Site" on your phone, you will receive a smaller version of the desktop site I designed. ProBoards said making a responsive, mobile version of the original wasn't possible, and I proved them wrong. The site has 1000's of members and visitors from all over the world.